He added the great unknown is what will happen post-elections, such as Special Counsel Robert Mueller’s next move, blue wave subpoenas and if President Trump will be combative or bipartisan. Rove predicts the midterm elections will be so close that the events of the next few days will have a big impact on the results. He largely agreed with King on election results and also spoke about the much improved tax environment, low unemployment and the really strong economy. He concurred with King on the uncertainty of post-elections. 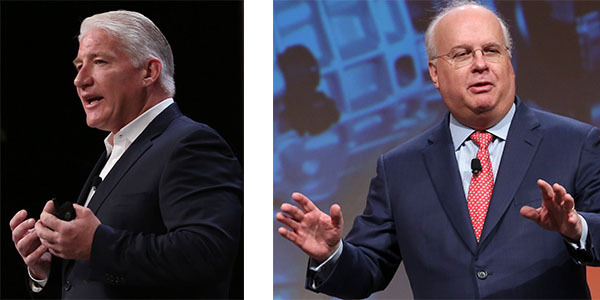 When asked how the automotive aftermarket gets a seat at the table, Rove encouraged the audience to attend town hall events and fundraisers, and invite members of Congress to their businesses. “Carve out time to be involved in political campaigns. Over time, it will have a huge impact,” he said. Hanvey and Long spoke about the tremendous transformation taking place in the automotive aftermarket, and encouraged audience members to become engaged in the industry and the political process. Both organizations offer legislative summits, with the 2019 MEMA Legislative Summit taking place April 30 – May 1, 2019, in Washington, D.C., and the Auto Care Association Legislative Summit being held in conjunction with Fall Leadership Days, Sept. 18 – 20, 2019, also in Washington, D.C.